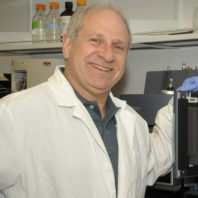 Dr. Philip Lazarus’ research is focused on the elucidation of carcinogenic mechanisms with an underlying theme of cancer prevention, focusing primarily on mechanisms involved in the induction and progression of tobacco-related cancers. As the major risk factor for aerodigestive tract cancer induction is the use of tobacco products, a major focus has been the study of tobacco carcinogen metabolism and the identification of biochemical and molecular markers of tobacco-induced carcinogenesis. A. Molecular epidemiologic studies examining genetic and phenotypic polymorphisms in xenobiotic-metabolizing enzyme as well as DNA repair genes as markers for cancer risk. The carcinogenic activity of tobacco carcinogens can often depend on the cellular composition/expression/activity of enzymes that are involved in the activation or detoxification of many tobacco carcinogens or the repair of the DNA adducts they induce. The expression and/or activity of these enzymes may be a critical determinant of individual risk for tobacco carcinogen-induced damage. Studies from Lazarus’ laboratory have identified function/expression-altering genetic polymorphisms for a number of these enzymes, and have shown that they may play a role in increased risk for certain cancers. Current studies are focused upon the identification of high-risk genotypes important in risk for other cancers including colon, esophageal and breast cancer, identification of novel chemoprevention agents, and enzyme promoter characterization and induction mechanisms. B. Studies characterizing carcinogen metabolic pathways and examining their role in cancer susceptibility. Studies have focused on enzyme pathways involved in the detoxification of the potent carcinogens benzo(a)pyrene and NNK. C. Studies are on-going examining a novel mechanism of regulation of the p53 tumor suppressor protein. Recent studies from Dr. Lazarus’ lab have demonstrated that a novel transcription-coupled translational control mechanism appears to play a role in regulating p53 protein synthesis in normal versus tumor tissues. These studies suggest that this novel translational control mechanism may play an important role in the up-regulation of p53 protein expression observed upon cellular insult or tumor initiation. Current studies have focused upon the characterization of this novel regulatory mechanism. Ashmore J, Gallagher CJ, Lesko SM, Muscat JE, Hartman T, Lazarus P. No association between vitamin D intake, VDR polymorphisms, and colorectal cancer in a population-based case-control study. Cancer Epidemiol Biomarkers Prev (accepted upon revision). Gufford BT, Chen G, Lazarus P, Oberlies NH, Paine MF. Milk Thistle Constituents Inhibit Raloxifene Intestinal Glucuronidation: a Potential Clinically Relevant Natural Product-Drug Interaction. Drug Metabol Dispos (In press). Gufford BT, Lazarus P, Oberlies NH, Paine MF. Predicting Pharmacokinetic Herb-Drug Interactions: Overcoming Hurdles that Extend beyond Drug-Drug Interactions. Amer Assoc Pharm Soc (NewsMagazine) April 14 2014; pp. 18-22. Angstadt AY, Zhu J, Muscat JE, Hartman TJ, Lesko SM, Gallagher CJ, Lazarus P. The effect of UGT1A and UGT2B polymorphisms on colorectal cancer risk: haplotype associations and gene-environment interactions. Genes Chrom Cancer. 2014; 53(6):454-66. PMID: 24822274. Ashmore JH, Lesko SM, Miller PE, Cross AJ, Muscat JE, Zhu J, Liao J, Harper G, Lazarus P, Hartman TJ. 2013. Association of dietary and supplemental iron and colorectal cancer in a population-based study. Eur J Cancer Prev. 2013; Mar 12. [Epub ahead of print]. “Role of Pharmacogenetics on Exemestane Metabolism and Toxicity” This is a collaborative study with Queens Unversity (Kingston, ON), Penn State University (Hershey, PA) and Harvard University (Boston, MA) to fully characterize the metabolism of the aromatase inhibitor, exemestane (commonly used for the treatment and prevention of breast cancer), and to explore the effects, both in vitro and in vivo, of polymorphisms that occur in enzymes that mediate exemestane metabolic reactions. NIH R01 ES025460 (Lazarus, Philip); July 2015- June 2020 (Pending) “The UGT2A and 3A metabolizing enzymes and tobacco-related cancer risk” The goal of this proposal is to examine the role of two previously under-studied phase II metabolizing enzyme sub-families (UGT2A and UGT3A) on drug response and cancer risk.